Sea Chanteys are fun songs, but in the days of the tall-masted sailing ships, they were the work songs by which the sailors labored in unison to hoist the sails, haul up the anchor and pump the bilge. 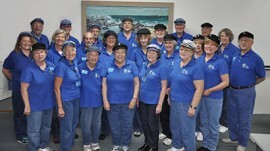 These tunes will come to life Monday, June 8 at 2 p.m. in the Taylor Home Atrium, courtesy of the Sea Chantey Singers. The event is free and open to the public. Please call 524-5600 Monday-Friday between 8 a.m. and 4 p.m. to ensure seating. It was grueling work – icy cold in the Atlantic gales and sweaty in the tropic calms – but the chanteys (from the French verb “to sing”) told tales of high adventure. These tales include harpooned whales that dragged them on a “Nantucket sleigh ride;” pirates they fought on the high seas; and women they wooed in ports around the globe. It is the special joy of the Chantey Singers to bring alive the folklore of the great days of sail, including politics, economics, science and fun – all in one rousing package!